Available in freestanding, floor-to-wall or floor-to-ceiling versions with a stationary or rotational column and/or transverse arm movement. Their extended vertical tracks allow for skull examinations of tall patients as well as exposures of the lower extremities. Convenient Control: All tubestand controls are centrally located for easy access. Electromagnetic lock system: Electromagnetic brakes provide positive tubestand exposure positioning. 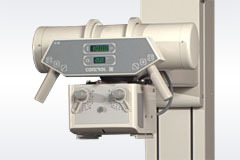 Dual rope counterbalancing system: Ensures maximum stability and safety for the patient and operator. Versatility: A wide variety of mounting and travel options off er great flexibility for a wide variety of exposures. 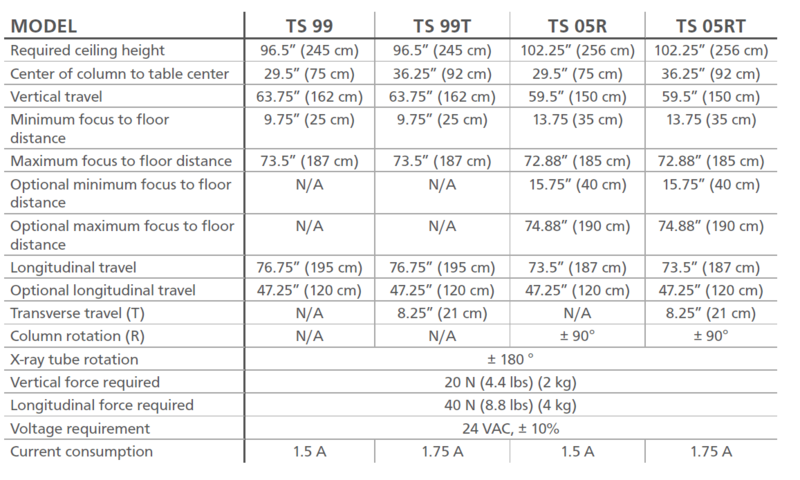 The TS 99 family of tube stands with its flexible configuration options suits all general rad room requirements. Choose and combine any of the options like rotational column (R), transverse arm movement (T), extended rails and digital SID display. Ideal for studies from lower extremities to chest/skull exposures due to its wide vertical motion range.